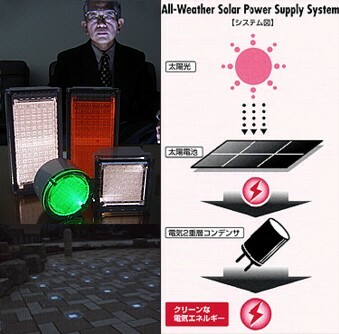 Sunlight Co., Ltd., a venture company based in Himeji, Japan, has unveiled a new line of self-illuminating bricks that contain solar-powered LEDs. The company expects the solar LED blocks, which are powered by sunshine collected during the day, to be used in the construction of public roads and parks. Embedded in sidewalks, the solar LED blocks can provide lighting underfoot at night and during power outages, and can be used for decorative purposes or for emergency evacuation lighting. The block's built-in solar cells and light components are arranged so that illumination is distributed evenly across the entire surface, an improvement over Sunlight�s previous solar LED blocks that featured a segregated component arrangement. The bricks use solar cells that efficiently store and generate electricity even on cloudy days or under poor lighting conditions, and they can emit up to 8 hours of continuous light (or 24 hours of blinking light). "In addition to improving the scenery, these lights can play a role in accident prevention and in emergency lighting during a disaster," says Yoshikazu Arai, President of Sunlight. "And they are environmentally friendly, too." The blocks start at 12,000 yen (US$100) and come in 5 colors.